countyimports.com motorcycles scooters - Pre-Assembled - BMS Roman 150cc Retro Gas Scooter - FREE SHIPPING! Looking for Retro? Let's go! The most traditional 150cc Scooter of all time. What a sound investment. BMS is well known for the best products with no leave unturned. More options, features and great free extras! These scooters are made to last and look as good in 10 years as they do the day they arrive! $1000 IN FREE UPGRADES ALONE! - Upgraded BELTS, LIGHTS, TIRES and more! Great gas mileage, powerful engine, quality and long time running design and savings in the literal $1000's from the other more expensive models out there that provide the same result. Buying a motorized gas scooter these days is now much more than a luxury. We have been faced with considering alternative means of transportation to save money due to gas prices being so dangerously high. What a better excuse but to let your gas savings buy you a brand new moped!?!. We have brought you this baby just in time. 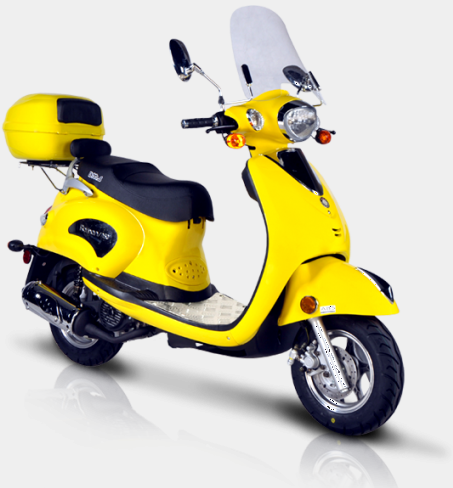 Have you been looking for a Brand New Scooter / Moped and pay used prices? We only got a few. Grab em while you can at this price! PRE-Assembled - Just Mirrors, Battery, Trunk and windshield need installing! Click here to compare STANDARD BASE MODEL. Full Parts Support Included! - Click Here To View Inventory! Height to seat £º 32"
Min ground clearance £º 6"
Shipping info £º FREE HOME DELIVERY! BE A RESPONSIBLE RIDER! FOR SAFETY, READ YOUR OWNER'S MANUAL. ALWAYS WEAR A HELMET, EYE PROTECTION, AND PROTECTIVE CLOTHING! NEVER RIDE UNDER THE INFLUENCE OF DRUGS OR ALCOHOL! ATV's - Parents consider your youngsters age, size, ability, and maturity before allowing them to ride. SCOOTERS, MOPEDS & MOTORCYCLES - Never ride on non-paved streets or non-public roads, and never carry passengers on your moped unless equipped to do so. Never engage in stunt driving or ride at excessive speeds. Be careful on difficult terrain. Riders under 16 years of age must be supervised by an adult. CountyImports.com recommends that ALL riders take a training course.www.safety.org/" target="_blank">www.safety.org/. We have a put together a great collection of actual course study information, videos and guides. You can have your children watch our atv and four wheeler safety videos anytime for free! Free Technical Support 877-300-8707on all products purchased from our website.